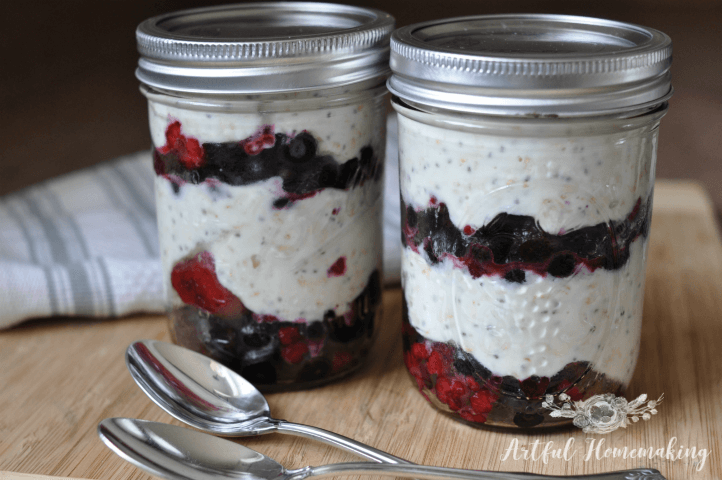 Make-ahead breakfast parfaits are perfect for busy households! Just grab your breakfast out of the fridge and you’re ready to go! A few years ago, I discovered this simple breakfast idea. After making it once, I was hooked! 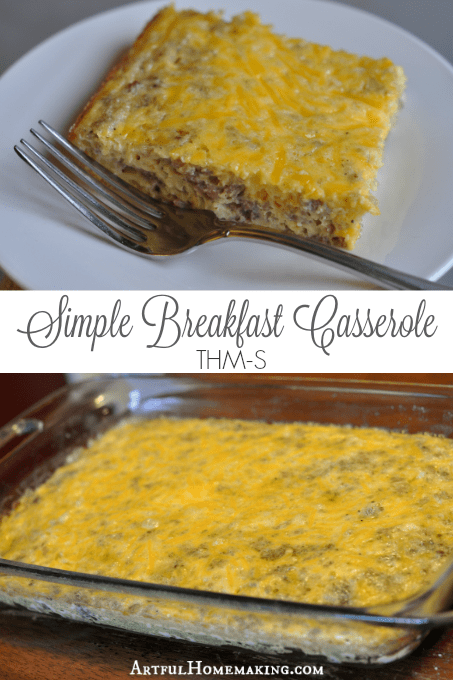 I’m a huge fan of anything that saves time in the kitchen, especially early in the morning (like this make-ahead breakfast casserole). 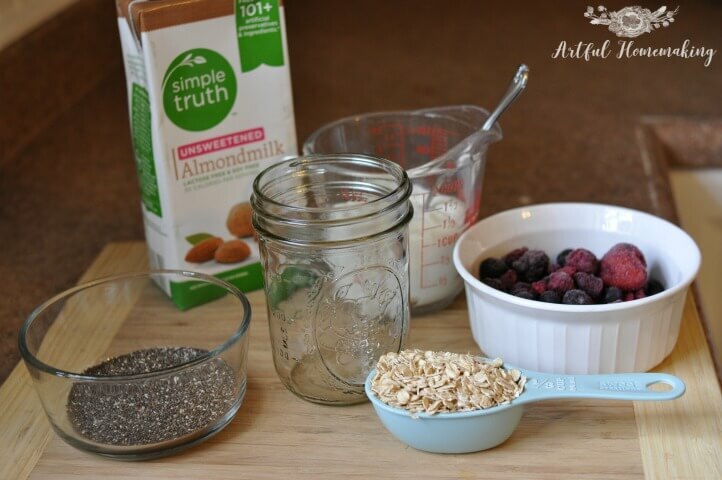 As an added bonus, this easy breakfast is also healthy (it’s sugar-free! ), and it’s a Trim Healthy Mama E meal. 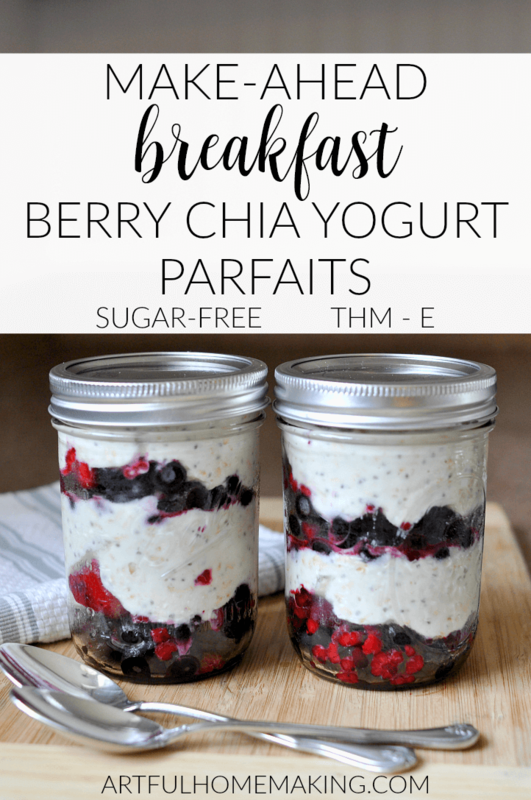 The delicious combination of yogurt, berries, chia seeds, and oats makes this a great healthy breakfast or snack idea. This recipe will make one parfait, but you can easily make more than that. I often make two of them at a time, but you could just as easily make enough for the whole family! Links below are my affiliate links. Read my disclosure here. 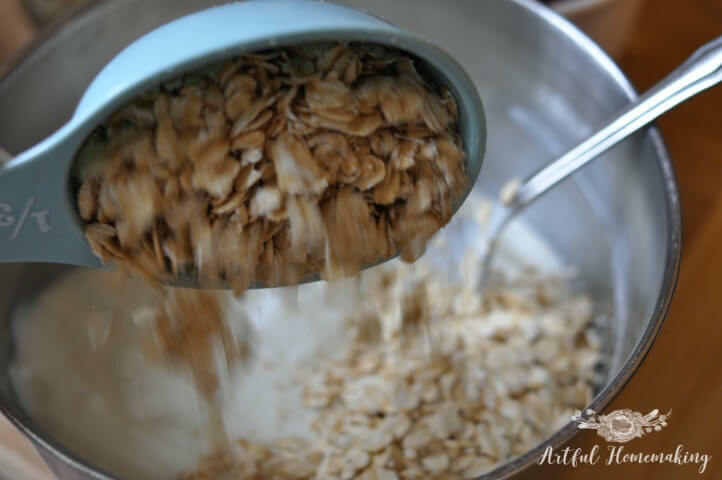 Combine the Greek yogurt, oats, almond milk, chia seeds, vanilla, and vanilla drops in a bowl. Stir well. 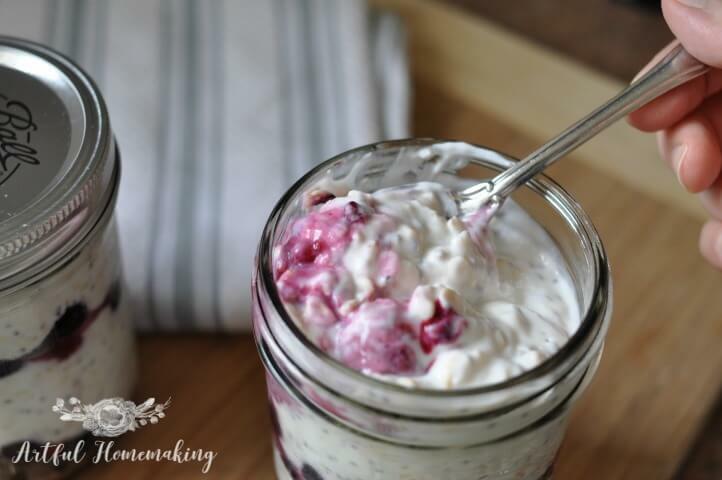 Layer half of the yogurt mixture in a wide-mouth Mason jar. 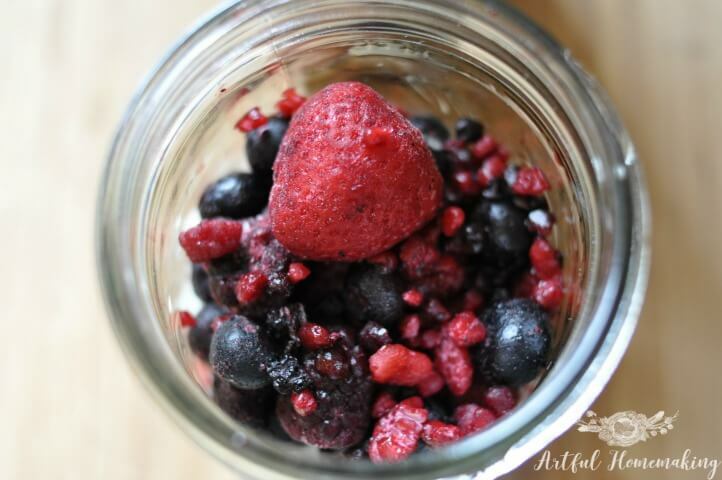 Then add half of the berries to the jar. 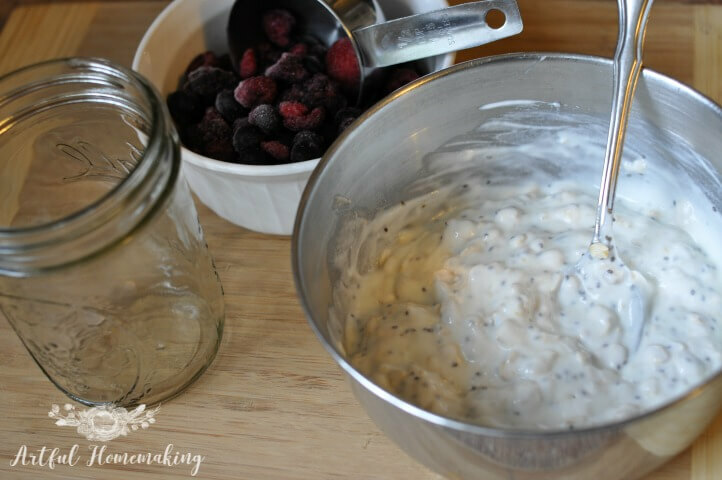 Add the rest of the yogurt mixture and the other half of the berries to the jar. Add a lid, and refrigerate. The parfaits will stay good in the refrigerator for 2-3 days. 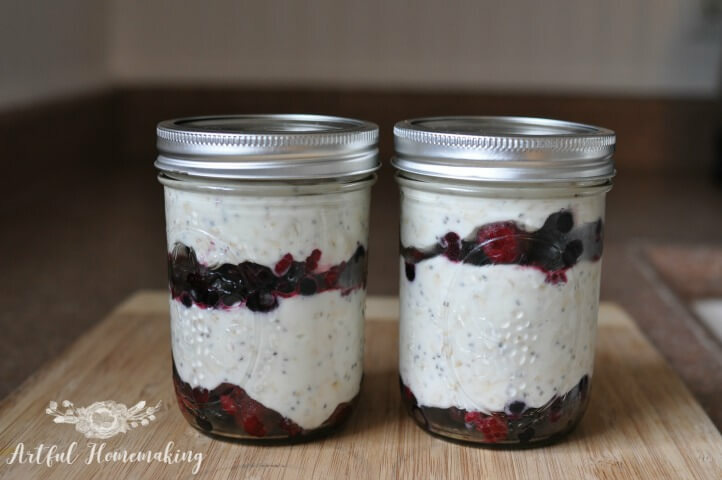 I love the way these make-ahead breakfast parfaits look in a Mason jar! They fit perfectly and they taste delicious. My husband is a big fan of them also. 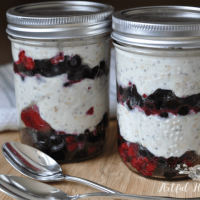 This make-ahead breakfast parfait recipe is easy to make and healthy, with berries, yogurt, and chia seeds. Add a lid and refrigerate. Enjoy! Saving time is always a plus, but then there is always that tasting good too. This recipe looks like it fills both wants. Thank you for sharing at Inspire Me Monday link party. Wow, I love this idea!!! My hubby was just talking about wanting more healthy breakfast choices! This looks so yummy! Thanks for sharing this at Booknificent Thursday on Mommynificent.com! Hello! Back again to let you know I am featuring this post at Thursday Favorite Things today! I hope you will join us again for this week’s party! Thanks so much for the feature, Amber! Hello thanks for linking up at TFT! I was wondering if I could sub coconut or almond yogurt? Thanks! Thanks for hosting, Amber! I’ve never tried it with other yogurts, but I don’t see why it wouldn’t work! I’m guessing it would work fine to substitute. If you try it, let me know how it turns out!